Cologne is the centre of the Cologne/Bonn Region with around 3 million inhabitants (including the neighboring cities of Bonn, Hürth, Leverkusen, and Bergisch Gladbach). According to local statistics, in 2006 the population density in the city was 2,528 inhabitants per square kilometre. 31.4 percent of the population has migrated there, and 17.2 percent of Cologne’s population is non-German. The largest group, comprising 6.3 percent of the total population, is Turkish. As of September 2007, there are about 120,000 Muslims living in Cologne, mostly of Turkish origin. 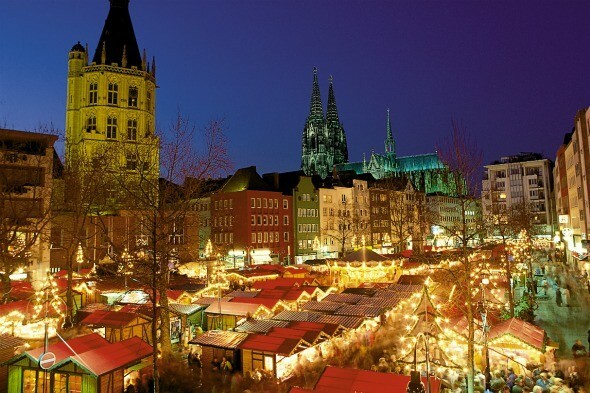 Cologne also has the oldest and one of the largest Jewish communities in Germany. In the city, the population was spread out with 15.5% under the age of 18, 67.0% from 18 to 64 and 17.4% who were 65 years of age or older (source). Cologne (German: Köln) is Germany’s fourth largest city and the largest city in the State of North Rhine-Westphalia. It is one of the oldest cities in Germany, having been founded by the Romans in the year 38 BC. Cologne lies on the River Rhine and is regularly affected by flooding from the river and is considered the most flood-prone European city. The University of Cologne is one of Europe’s oldest universities and the largest in Germany. Cologne’s international airport is Cologne Bonn Airport (CGN). The airport is shared with the neighbouring city of Bonn. The city’s famous landmark and unofficial symbol is the Köln Cathedral, a Gothic church, started in 1248, and completed in 1880. It is the seat of the Catholic Archbishop of Cologne. Cologne also has twelve Romanesque Churches, illustrating examples of medieval sacral architecture. The roots of some of the churches date back as far as Roman times, and all the churches, with the exception of St. Maria Lyskirchen, were very badly damaged during World War II. Reconstruction was only finished in the 1990s. Other tourist attractions in the city are the Farina Fragrance museum (the birthplace of Eau de Cologne) and the Chocolate museum officially called Imhoff-Schokoladenmuseum (source). Roman Catholicism, one of Germany’s two principal religions, traces its origins to the eighth-century missionary work of Saint Boniface. In the next centuries, Roman Catholicism made more converts and spread eastward. In the twelfth and thirteenth centuries, the Knights of the Teutonic Order spread German and Roman Catholic influence by force of arms along the southern Baltic Coast and into Russia. In 1517, however, Martin Luther challenged papal authority and what he saw as the commercialization of his faith. In the process, Luther changed the course of European and world history and established the second major faith in Germany–Protestantism (source). The second largest religion is Islam with 3.3 million adherents (4%) followed by Buddhism and Judaism. During the last few decades, the two largest churches in Germany (the Protestant Evangelical Church in Germany (EKD) and the Roman Catholic Church), have lost significant number of adherents; both are down to roughly 30% (by the end of 2008). With 30.7 % as per the end of 2008, the Catholic Church is still close to its pre–World War II 1939 percentage of 33%. The most notable losses occurred in the Protestant churches in East Germany largely owing to the atheistic policy under the communistic regime. However, since the fall of the communistic regime two decades ago, the EKD continued losing members, to just below 30% by the end of 2008. Other churches in Germany are all rather small (equal or less than 0.5%). As a result of re-unification (of East and West Germany), the number of Germans without a religion has grown, especially owing to the addition of the eastern states with their large non-religious majority. Due to losses of both the Protestant churches and the Catholic Church in Hamburg, this state has also joined the group of Bundesländer with a non-religious majority.